To minimize risk of flooding to landowners along the Salinas River and improve riparian habitat for wildlife, the Salinas River Stream Maintenance Program (SMP) was developed as a collaboration between Monterey County Water Resources Agency, the Salinas River Channel Coalition (growers and landowners), the Grower Shipper Association of Central California, The Nature Conservancy, Conservation Collaborative, the RCDMC, and other local entities and contractors. The SMP employs a multi-benefit approach for stream maintenance that enhances conveyance capacity of the river corridor by mimicking the sandy-bottomed river’s natural, braided form in a manner that protects fish and wildlife habitat. The SMP involves clearing vegetation (often invasive weeds like Arundo donax) through mowing and discing and smoothing or removing sediment to open and maintain secondary channels on the river floodplain. These channels are designed to convey high flows during and after large storm events, reducing the risk of flooding onto adjacent farmlands and decreasing pressure on levees. Secondary channels connect with the main stem of the river at their upstream and downstream ends, but are at higher elevation than the low flow river channel. Mitigation for impacts to native riparian vegetation is through Arundo donax removal. Participants must also plant trees to mitigate for large tree removal. 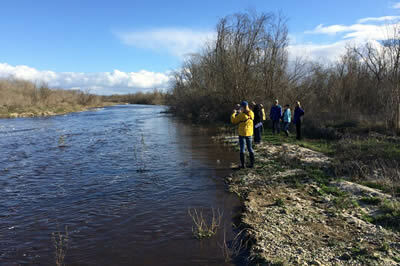 In 2014, a Demonstration Project of the SMP was initiated on two stretches of river near Chualar and Gonzales (south of the City of Salinas) comprising a total of 11.5 river miles. In 2016, the SMP expanded to include most of the river's length (92 miles) in Monterey County, and has since been operating annually. Participation in the program is voluntary, and the work is primarily funded by the participants (typically landowners, growers, and municipalities) with some supplemental grant funding. The RCDMC helps the Monterey County Water Resources Agency administer the SMP. The RCDMC holds the Routine Maintenance Agreement from the California Department of Fish and Wildlife, and oversees the required biological surveys and monitoring for the program. More information about the Salinas River Stream Maintenance Program can be found on the Monterey County Water Resources Agency SMP project webpage. Landowners interested in participating in the SMP can contact RCDMC Ecologist Emily Zefferman.